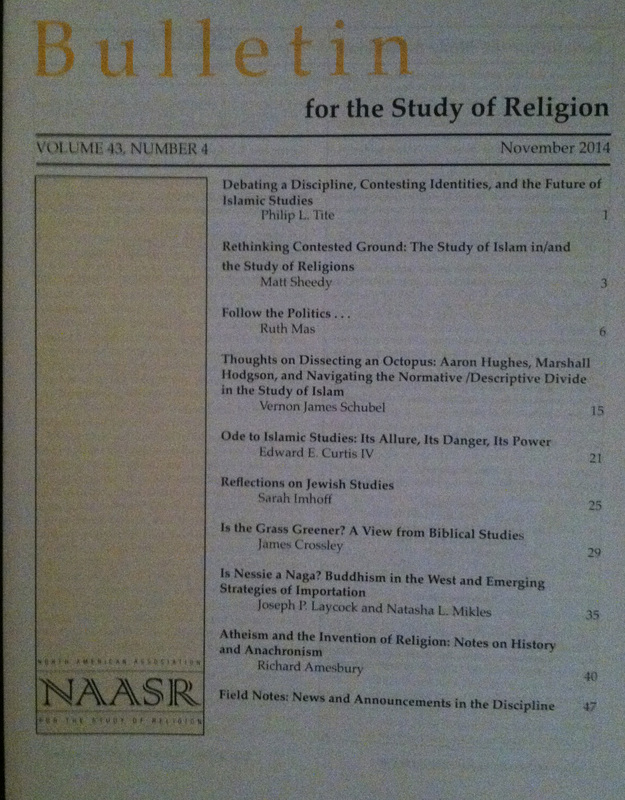 The following is the editorial introduction to the November 2014 issue of the Bulletin for the Study of Religion (the full table of contents having already been posted). We offer this editorial here on the blog in order to give readers an overview of the most recent issue of the Bulletin. With every prevailing consensus, there inevitably arise alternative perspectives to challenge the assumptions, agendas, and self-evident truths within a regnant discourse. Such challenges, of course, are also open to contestation. Often such disciplinary debates are set within dichotomies, obscuring and obfuscating a larger range of methodological and theoretical positions. Although such conflict permeates the field of religious studies, a recent online debate between Omid Safi and Aaron Hughes has brought Islamic studies—especially the study of Islam within religious studies—into the foreground of such academic identity politics. This debate erupted on and around the Bulletin’s blog earlier this year, sparked by a post by Hughes (2014) that critiqued an online article by Safi (2014)—a critique that is echoed in Hughes’ Theorizing Islam (2012). Given the large interest in this exchange, we decided to run a series of blog posts on the issues raised by both Hughes and Safi, issues that move us far beyond two disagreeing scholars toward a reassessment of the very future of Islamic studies (and, by extension, religious studies more generally). This issue of the Bulletin includes a panel of papers that build on that online exchange, with authors developing their original ideas more fully into scholarly articles in order to continue the discussion (and to invite others to jump into the fray). The five contributors—Ruth Mas, Vernon Schubel, Edward Curtis, Sarah Imhoff, and James Crossley—offer a range of perspectives on the future of Islamic studies vis-à-vis the Hughes-Safi debate. In his introduction, Matt Sheedy, our associate editor who oversees the blog, effectively presents each contribution to the panel. Unfortunately, both Professors Hughes and Safi declined our invitation to respond to these papers. However, the discussion will continue with an online roundtable revolving around these papers. We encourage readers to follow that roundtable on the blog site. A central point of contestation that arose, and which is reflected in this issue of the Bulletin, is the place of the insider and the outsider in the study of Islam. The emic vs. etic debate is nothing new to religious studies scholars, but for Islamic studies it has increased in intensity over the past thirteen years. Since 9/11, scholars of Islam (especially within the North American context) have been called upon by the general public, especially via the media, to speak about Islam, religious violence, and East/West relations. The public hunger for information on Islam has also resulted in a surge of hires in Islamic studies over the past several years, running against the grain of a collapsing job market in religious studies since, especially, 2008. Undoubtedly we have been witnessing a new phase in the history of Islamic studies within religious studies. While this transformation of Islamic studies has brought about many benefits, it has also resulted in the charge of apologetics. Hughes is not alone in his concern that Islamic scholars have been actively constructing a progressive, liberal, and benign image of Islam as normative (as a defense of Islam vis-à-vis those “fringe” or “sectarian” groups who do violence in the name of Islam). This charge of “caretaking” a religious tradition feeds into a dichotomous discourse of insider vs. outsider, along with the question of whether Muslim or non-Muslim (i.e., Western) scholars should be studying Islam within the academy? Does insider status obscure or enhance the academic endeavor? This Western vs. Muslim divide, however, is nothing new. Debates over Qur’anic origins, for example, have long been drawn along such lines—especially when dealing with John Wansbrough’s insightful yet controversial challenge to traditional narratives of Qur’anic origins (and those who have built on his work, especially the highly speculative “Hagarism” proposed by Patricia Crone and Michael Cook) or even when looking at such nineteenth-century scholarship as that of Abraham Geiger or Theodor Nöldeke. However, the debate is not strictly a West/East divide (evoking the specter of Orientalism), but is a debate actively engaged among scholars well situated within so-called Western communities—a point that Andrew Rippin has stressed in his contrast of nineteenth and late-twentieth-century scholarship vis-à-vis Orientalism. Such names as Fazlur Rahman, Amina Wadud, and Mohammed Arkoun all come to mind. Both Safi and Hughes are embedded within the constructs and constraints of Western liberal intellectual concerns. In this sense, they are both “emic” (within the academy), though with conflicting (normative) views on what should constitute an academic study of Islam (and, by extension, religion). With such a qualification in mind, the articles on the future of Islamic studies in this issue are, in a sense, more “data” for us to theorize. If anything, they invite readers to enter into the debate and to continue the conversation. This issue of the Bulletin also includes two articles beyond the panel. Joseph Laycock and Natasha Mikles offer a fascinating look at the cultural transformation of the Loch Ness monster in Scotland by Lama Gelongma Zangmo, who reconceived “Nessie” as a fantastical water creature from Hindu and Buddhist mythology, known as a naga. Richard Amesbury tackles the discursive conflict between atheism (particularly the New Atheism) and religion. Amesbury challenges the encoded normative and timeless understandings of atheism, seeing it as a product of the nineteenth-century “invention of religion.” Atheism is as historically and discursively located as is religion. Amesbury’s historicizing the atheism vs. religion debate helps us to recognize the reified and contingent nature of our classifications, rendering both “religion” and “atheism” objects of historical analysis. Finally, this issue of the Bulletin closes with a conference report by Natasha Mikles on the 2014 NEH Summer Institute on the topic “Problems in the Study of Religion.” We are delighted to include such a report within our “Field Notes” section. _____. 2014. “When Scholarship is Just Bad Scholarship.” Bulletin for the Study of Religion blog. http://www.equinoxpub.com/blog/2014/02/when-bad-scholarship-is-just-bad-scholarship-a-response-to-omidsafi/. Rippin, Andrew. 2006. “Western Scholarship and the Qur’ān.” In The Cambridge Companion to the Qur’ān, edited by Jane Dammen McAuliffe, 235–51. Cambridge University Press. Safi, Omid, 2014. “Reflections on the State of Islamic Studies.” Jadaliyya. http://www.jadaliyya.com/pages/index/16269/reflections-on-the-state-of-islamic-studies. [1.] “Early in the twentieth century, the notion of what was meant by Western scholarship on the Qur’an would not have created much discussion. It was quite obvious that the phrase referred to scholarly work on the Qur’an undertaken by European academics who were not Muslims. Continuing with such an understanding in the twenty-first century is quite problematic” (Rippin 2006, 235). This entry was posted in Academy, Announcements, Editorial, Joseph Laycock, Matt Sheedy, Natasha Mikles, Philip L. Tite, Reflections on Islamic Studies, Religion and Popular Culture, Religion and Society, Religion and Theory, Theory and Method, Theory in the Real World and tagged Aaron Hughes, Atheism, Belief, biblical studies, Buddhism, Bulletin for the Study of Religion, Edward E. Curtis IV, emic, etic, Hinduism, Islam, Islamic studies, James Crossley, Jewish studies, Judaism, Loch Ness, Loch Ness Monster, naga, NEH, new atheism, Omid Safi, orientalism, Qur'an, Qur'anic origins, Qur'anic studies, Religion, religious studies, Richard Amesbury, Ruth Mas, Sarah Imhoff, scholarship, Scotland, secularism, Vernon James Schubel. Bookmark the permalink.